Stick insects can survive death. Okay, it’s true that the insect that is eaten by a bird is dead, but its eggs can live on. Some of the hard eggs are able to survive going through a bird’s digestive system and are able to hatch once they are pooped out. In this way, the stick insects are able to colonize a larger area than they would be able to on their own. It is well known that plants develop attractive fruit so that the tough seeds contained within will be transported further and expand their range. Japanese researchers hypothesized that some insects may also employ this same strategy. They chose stick insects as their study subject for a few important reasons. First of all, stick insects have very hard and tough eggs, so that they could potentially survive being digested. Second, female stick insects always contain eggs and many species don’t need their eggs to be fertilized for them to be viable. Third, newly hatched stick insects are able to fend for them and locate plant food on their own. Therefore, stick insect eggs meet all the criteria to be able to survive being eaten by a bird. Stick insect eggs collected from brown-eared bulbul excrement (left), and a stick insect hatched from the eggs (right). Image credits: Kobe University. The researchers put their hypothesis to the test. They fed the eggs from three species of stick insects to one of their principle avian predators, the brown-eared bulbul. Between 5-20% of the eggs were excreted from the bird undamaged. 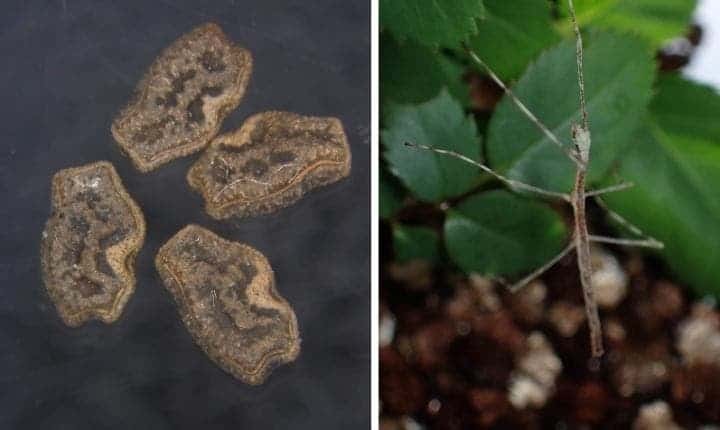 The researchers also tested the hatching rate for one of the species of stick insects and they were actually still able to hatch and survive. An infographic showing how the stick insect’s eggs can be dispersed. Image credits: Kobe University. Other insect groups may also meet these criteria and be able to disperse through being eaten. The insects take advantage of seemingly hopeless situation (being eaten) to actually benefit the species (by widening their distribution). Stick insects are often eaten by birds so this strategy could be very beneficial for them. It could explain how some small insects colonized some surprisingly remote locations. For example, many stick insect relatives are found on islands. Stick insects do not try to be eaten (they try to hide, not to be seen), but surprisingly, being eaten can have benefits for the species. Journal reference: Suetsugu, Ito, Yokoyama (2018) Ecology.